San Luis Valley Pizza Company, originally uploaded by All Things Mimi. So the local rumor mill has yet again been churning. The subject of the latest round? The San Luis Valley Pizza Company. It is located right next to the ABC Pro Bowl here in Alamosa. At first, the location scared me, because the last pizza place to be there was awful. It was a pizza buffet and it had the worst pizza I had EVER had- cardboard crust, skimpy toppings, slow pizza turnover under the heat lamp, blah, blah, blah. But the skuttlebutt I heard on the street made me change my mind. I heard, from various sources, that the wonderful chef over at Milagro's (I hate that I can't remember his name. I want to say it's Randall, but that could be wrong. I'll ask next time we go) was leaving to join his family in a new restaurant. This- while probably bad news for Milagro's- is good news for the new pizza place. So....after Dev and I got back in town this afternoon after a weekend of snowshoeing and hanging out with his parents, I decided we should go check the place out. And I'm so glad we did. The decor of the place hadn't changed that much. But there was lots of stuff from local schools on the walls, and pics of the local flora and fauna. 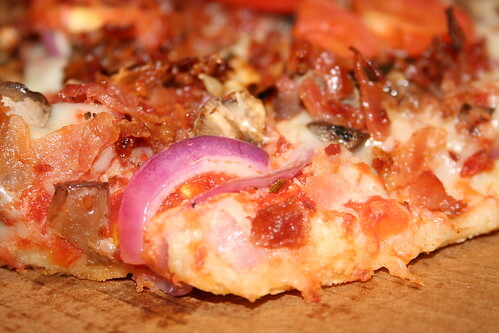 The toppings on our "Los Cumbres" pizza included roasted garlic, red onion, bacon, tomato, fresh mushrooms and some other things I can't remember. The pizza was very good, and it included a brief floor show by the chef, illustrating how to "throw" pizza dough. And most importantly, our the service was good. We didn't have to give the international sign for choking to death to get our water glasses filled, and we were checked on several times thoughout our dining experience. The menu is somewhat limited right now (the guy is still working out his notice at Milagro's). We stopped and talked to him on our way out, and we were promised that the menu would expand soon- to include calzone, more New York style pizza, sausage cannoli and some of his famous homemade soups. They are planning a lunchtime buffet of soup, salad and baked potatoes. I think that will be a wonderful addition to Alamosa's very limited lunch choices. AND I hope he keeps the joint open on Monday nights. I hate it when restaurants close on Mondays. People still gotta eat, ya know? I give a hearty thumb's up (or should that be a fork?) to the San Luis Valley Pizza Company. I wish them all the success in the world. Oh!!!! I almost forgot- this guy was the mastermind and work horse behind Milagro's sushi Friday's, and he told me they might continue the sushi tradition at the new restaurant. I can't tell you how awesome that would be, because Milagro's was my only source for good sushi here in the valley...but that's another post for another time. Aww man, sorry I missed it. Glad it was good. Sounds good! Hope it turns into a good place to go. Is this Chamber Phil? What has your Dad got to do with SLV Pizza?? Excellent! I hope you enjoy working there as much as I enjoy eating there!